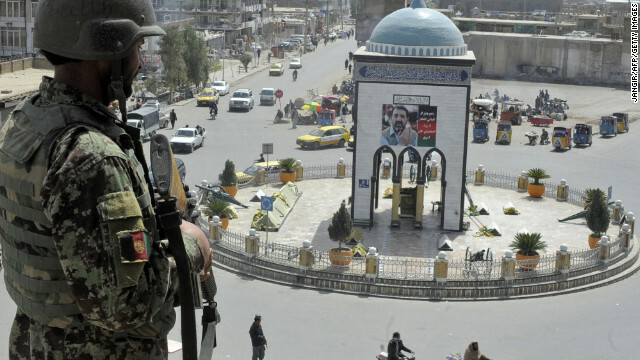 An Afghan National Army soldier stands guard in the main square of Kandahar, Afghanistan. Editor's note: Michael O’Hanlon is co-author, with Martin Indyk and Kenneth Lieberthal, of the new book Bending History: Barack Obama’s Foreign Policy. You can read more from him on the Global Public Square. The views expressed in this article are solely those of Michael O'Hanlon. The Afghanistan war is a slog at best. There is little doubt about that. Even those of us supporting the mission must acknowledge that it has been slower and harder than expected. The reasons are generally well known, including a resilient and highly motivated insurgency with sanctuaries in Pakistan; a corruption-ridden Afghan government that, by its poor governance, gives sustenance to the Taliban; and mistakes on the part of NATO, which for years pumped too much poorly regulated cash into a country unable to handle it, fueling corruption in the process. As NATO leaders gather in Chicago this week for a major summit where Afghanistan will be issue No. 1, it is understandable why their citizens are tired of this effort. And with Osama bin Laden dead and other al Qaeda leaders out of the picture or out of the region, the motivation behind the effort seems less compelling to others as well. Nothing I saw on a recent trip to Afghanistan dispelled the above realities. But I also saw plenty of good that should give us encouragement. Because we already have an exit strategy to have most NATO troops out of Afghanistan by the end of 2014, no one needs to worry too much about a possible quagmire. Beyond that, there are good reasons to think that even if this mission cannot achieve its loftiest earlier goals — a strong democracy and a clearly defeated insurgency on our watch — it can likely attain the minimal acceptable requirement: preventing a Taliban return to power and a major al Qaeda presence on Afghan soil. • Afghan security forces have almost reached their envisioned full size of 352,000, counting army and police. This has been accomplished despite the fact that the Afghan army and police needed to be built as they were fighting. They are now collectively taking at least twice the casualties of NATO forces, participating in at least 90% of all operations and leading some 40% of operations themselves (albeit usually the simpler ones at this point). • While the security forces still suffer from political patronage appointments and corruption, the problems are at least being partially addressed. In the east, some 50 Afghan army leaders have been replaced in the last year; 70 police officers were just recently fired in the west for poor performance. The Ministry of Defense has also opened a full criminal investigation into the problems that produced corruption and theft at Afghanistan’s main military hospital last year. To be sure, such efforts could be too little, too late. There are pockets of serious remaining problems, such as with the country’s air force. And some of the firings and hirings raise concerns of ethnic bias. But on balance, the progress is picking up. • The Afghan Local Police, a form of armed community watch overseen by NATO troops, is proving its mettle. These lightly armed and locally organized forces are holding their ground in some 80% of all firefights, even when sometimes outgunned by the Taliban, and they are taking the highest rate of casualties of any part of the Afghan security forces. There have been a handful of cases of abuse within this program, and a number of illegal militias are falsely adopting the name Afghan Local Police to disguise their true nature (which is sometimes to attack their neighboring tribes or communities). But U.S. special forces have monitored and worked with the actual forces effectively and stepped in to address problems when needed. The admittedly daunting challenge in the coming months and years will be to keep growing the program while also gradually handing oversight over to Afghan special forces. • Politics are breaking out in Afghanistan. The presidential election is still two years away, but new political organizations are forming, electoral reform movements are gaining steam, and everyone is forming their short lists of the most likely candidates for the race — some of them actually serious reformists! For the first time in its history, Afghanistan is preparing for a peaceful transfer of power accomplished by political competition. We do not yet know, of course, if the process will be successful. But there is political energy in the air. • Recent Asia Foundation work suggests that the quality of governance is improving at the provincial level. There are still too many bad actors and too much interference from Kabul in the day-to-day operations of regional governments. But by one scale at least, the average quality of governance has improved at least 10% over the last year. • A spirit of hopefulness, more than fear, characterized most of those I spoke with in Kabul recently.Worries about ethnic tension and even the prospect of civil war after the NATO departure have grown over time. But the recent signing of the U.S.-Afghan Strategic Partnership Agreement reassures many that they will not be left to their own darker angels — or the mercy of their neighbors — when NATO’s transition is complete. • On the anticorruption front, more than 100 companies or individuals (some of them U.S.-based) have been debarred from working with NATO because of suspicions of corruption or association with enemy elements. This overdue effort requires constant vigilance to be sure that companies or individuals that have been debarred once do not simply reorganize under a different name. But NATO is finally on the job on that matter. Much still needs to be done, of course. Land reform, and the prevention of land expropriation by corrupt actors, demands attention. Electoral watchdog organizations need to be strengthened, and means of possible voting fraud need to be reduced, before 2014; otherwise, cheating and scandal could delegitimize the election outcomes and contribute to more ethnic tension. The international community needs to find leverage — and communicate its willingness to use that leverage — to maximize the chances that good leadership emerges from that election, conditioning future aid and troop levels on the quality of future Afghan governance. The army and police still need to get a lot better. Some of the worst of the worst need to be arrested and tried for corrupt ways. Pakistan needs to help more. Even if true alliance and friendship are unlikely, we at least need Pakistan to behave like the “frenemy” it once was instead of the antagonist it has more recently become. But all these points are pretty well known. Less well known is all the good happening in Afghanistan. Whether it will be enough in the end is unclear, but there is a lot to build on. What a hack O'Hanlon is. He has been 100% wrong about Afghanistan 100% of the time for the last six or seven years (when he first found it on a map and realized there was thinktank money to be made from this knowledge and from parroting the Pentagon line of delusional optimism.) The article is just another in his long string of accolades for the emperor's new clothes on Afghanistan. Why does CNN continue to run this kind of tripe from people with track records of epic failure in discussing Afghanistan? Everything in this article is nonsense. The Afghan security forces are nowhere near 350,000 men. This is just O'Hanlon parroting the Pentagon lie. The ANA has, at most, 100,000 men, 40% of whom desert every year. The police are a net security negative, the local police program is a malign cancer on the countryside. I could go on debunking this nonsense, but what's the point? O'Hanlon is just a Pentagon shill. Mike Smith, O'Hanlon wrote, "Afghan security forces have almost reached their envisioned full size of 352,000, counting army and police". Nato officials said they hoped to build the Afghan police and army to a force of about 352,000 by the end of 2012. So O'Hanlon had made it up. The U.S. had previously proposed scaling numbers back to about 230,000 after 2014 as the security threat would fade and Western financial support shrink. Learn to read or at least understand what you're talking about. The writer is summing up the numbers for ANSF which includes ANA, ANP, ABP, ANCOP, etc. Where'd you get your 40% figure? The Congressional hearing I watched 2 months ago CLEARLY stated they were no where near 350,000 and not expected to achieve it... as NOTED the Soviets tried to get 250k and were unable too so they were asked how the USAs goal 350k.... ALSO noted in that meeting was Afghanistan has no income and therefore can NOT pay this military so why are we wasting our money. This author is a known paid pentagon mouthpiece. And failed article trying to convince americans to stay 10 more years and spend another 200 trillion on a hell hole of a country. The maintenance of the Afghan Securitry Forces costs more than the gross domestic product of Afghanistan generates.Nato forces are being gunned down by uniformed Afghan Security Forces and Pakistan is still a safe haven for the terrortists of the world. Our funding props up Karzai and his corrupt administration.It funds the ISI with all their shenanigans. It drains badly needed resources at home. It is a bottomless pit. 2014 has become 2024 The Northern Alliance polices southern Afghjanistan where they are hated by indiginous Pastuns. Poppies proloiferate. What has changed? The creation of a separate and autonomous Pastunia might be a start and if that means Taliban participation it is their area of strength anyway. It will provide Pakistan with the buffer zone they desire and the elements that they think they need to defend against their foe ,India. We should be funding education not weapons in Pakistan and maybe schools would replace Madrassas and civilian rule would replace military dictatorship. You may want to rely on Karzai but I sure don't. The rest of the world has realized this and Nato countries are tired of this as well. It should be evident in the streets of Chicago shortly. Serious reconsideration is in order. Here goes O'Hanlon again, belly-hooing why we are "winning" the war in Afghanistan. Thr Afghan security forces have to be paid to fight while the Taliban do it for free! Members of armed forces all over the world are paid. They are paid to fight for their countries and while they are on duty their families can buy food and other amenities. The bad guys are also paid–by ripping off the locals they harass, by stealing from everyone they encounter and by dealing drugs. What? you thought allah the magnificent and his profiteer 'hammed taught them to fish so that they could eat? No, actually the Taliban are paid more. Can you prove that, Simon? The West keeps on pouring in billions of dollars on behalf of the Karzai government and his forces, but who's subsidizing the Taliban? Nobody! Willie12345, George Patton, J. Foster Dulles, Joseph McCarthy, Marine 5484, Yacobi, Patrick-2 – whomever you are today. How can YOU state that the Taliban is not paid and not heavily subsidized by followers of Islam all over the world. What do YOU know? Just how many Muslims do you know who have billions upon billions of dollars to help the Taliban? Then again, what do you ignorant Tea Partiers know anyway? Get real, will you?! Willie12345, George Patton, J. Foster Dulles, Joseph McCarthy, Marine 5484, Yacobi, Patrick-2 – There is 1.5 billion muslim on this earth and I am sure they all donate money to the cause. Let us not forget about the 72 virgins each nutbar thinks he is going to get from allah the magnificent. Since none of these guys can get laid in real life! Opium doesn't treat glaucoma genius, that's marijuana. Opium is made into pain killers, AKA opiates, such as morphine. No doubt the Afghan forces, the ANA have definitely become more professional and the recent Taliban attacks in Kabul showed how competent they had been in fighting. The question is, how it would fare against the Taliban once the ISAF gone after 2014. There had also been doubts about the reliability of Afghan soldiers, after an increasing number of turncoats, who turned their guns on their Nato colleagues. Hamid Karzai said in April that the number of security forces shouldn't be reduced until at least 2015 or 2016, depending on the situation on the ground. The other problem will be that it's difficult to assess the strength of the Taliban. Their brazen attacks have plunged the country into chaos and it's doubtful that the Afghan authorities and its Western allies could win this war militarily. Talks and negotiations are still the best alternatives for this Afghan endgame. Islame is the #1 reason for NO hope. NO hope for the extremists of islam. Turn around, we are right behind you. You have nowhere to go except to see Shatan. It's sorry thing to say, but O'Hanlon is hoping what he wrote will work, but I don't think so. I think after we leave the country will go back to the way it was before. In that part of the world they are the way they are and won't become like the west, like the west wants. If they want to, they will have to do it on their own. Does anyone remember the original reason for invading Afghanistan was to capture/kill Bin Laden? Now that Bin Laden has been killed, it is time to leave Afghanistan. The simple truth is that most Afghans dislike NATO/American soldiers. The only possibility to defeat a guerrilla war is to have the support of the local population. If the local population does not give NATO troops info about the Taliban, then it is impossible to defeat the Taliban. The local population due to fear of Taliban or dislike of NATO/American troops are not willing to help defeat the Taliban. It is time to bring our troops home and let the Afghan people decide their own fate. Actually, C S, the impetus for US troops going into Afghanistan was to deny Al-Qaeda sanctuary in that region of southwest Asia. Your comments are steeped in half-truths and skewed data. Within this dynamic environment with many moving parts from politics to military to national security, your absolutist point of view leaves much to be desired. While it is unclear what your source of information is that led to your comments, there definitely are some of your 'facts' that need to be considered, developed and reviewed for accuracy and impact. Power perceived is power achieved...perceive truth. Ahh optimist and their hope springing eternal. Give it 5 years and Afghanistan will be just like it was before we wasted the time, money and lives lost over the past 12 years. I think that's great. NOW BRING OUR BOYS HOME THEY'VE BEEN THERE TEN YEARS ALREADY! THERE'S *NOTHING* THAT'S GOING TO CHANGE IN THE NEXT TWO YEARS. IF IT WERE POSSIBLE TO ACCOMPLISH THIS THING THEN IT WOULD HAVE HAPPENED ALREADY. Ten years, folks. 3,652 days. 520 weeks. Enough is enough. Thank goodness that after we leave there won't be arms dealers playing to both sides to make a profit; and that Iran won't be messing around in there to destabilize things just for kicks and giggles. And I'm so glad there won't be drug traffickers messing around in the place either, even with potentially billions in profit to be made with low cost. Just keep sending the good stuff. I love how this article paints a positive light on the situation in Afghanistan.....but then reveals how completely worthless the author's opinion is when they state "most of those I spoke with in Kabul." Of course those in Kabul are hopeful, the Afghan government has solid control of Kabul but it's control outside of the urban areas, which is the far far majority of Afghanistan, is in its infancy at best. The government has no control in the rural and mountainous areas of Afghanistan and the boarder between Afghanistan and Pakistan is a line in the dirt where people, insurgents, illegal weapons and illegal drugs pass with little to no restriction. Hey Mr. O'Hanlan, why don't you speak to local Afghans in the Eastern boarder regions of Afghanistan? Make sure that you speak to them during the Summer months too. But that will never happen because it's too dangerous. They don't call it "Fighting Season" because that's when HBO boxing comes on tv. Can anyone remember the same arguments being made as US forces pulled out of Vietnam. Can anyone remember the term "Vietnamization?" When the final Western boots leave the ground–that's when the disintegration begins. Graft and greed takes over, and one can envision, as happened in VN, soldiers going unpaid because the funds supposed to pay them have been scooped up along the funding route by corrupt national and regional officials, who will be financially secure enough the flee the country when the collapse occurs. That's when Afghan soldiers join the Taliban. Amazing what a trillions dollars will buy. Bright spots in Afghan land? Ooooo there's another one... good Predator. Someone needs to take off his rose colored glasses. Yeah we totally got this, just 10 more years. There is no honor in war, thats just something they tell soldiers so they'll risk their lives. Thank you, Suckers. You nailed it good! The hope for Afghanistan lies in direct proportion to a rapproachment with the Pakistani government, military, and the ISI. What are the odds, in a region devoted to terrorist training, the drug trade, and little semblance of legitimate capitalist inclinations like we experience. This is the type of long-term conflict that the military-industrial complex has frothed for. When will we kill the last terrorist? It will never been too soon to pull the majority of our troops out of Afghanistan. Perhaps the election outcome will have a magical effect. You're in reality a excellent webmaster. The site loading velocity is amazing. It seems that you're doing any distinctive trick. Also, The contents are masterpiece. you have performed a wonderful activity on this matter!